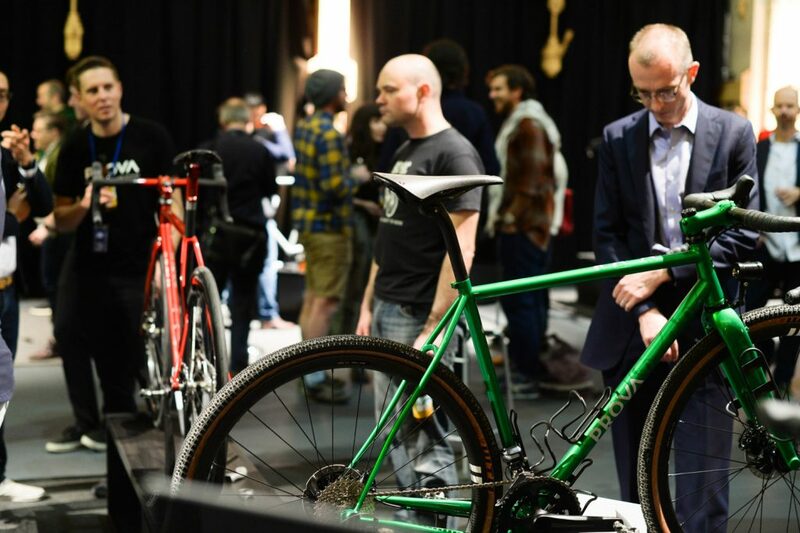 In this article and video I will outline the custom bikes (Road, Touring, Cyclocross and Mountain) that were on display at the recent Handmade Bicycle Show. I will also make an analogy to the local Australian beer market, which I believe is a comparable market when you consider the demographic and the love and passion producers have for their craft. Additionally, I’d like to ask you to leave a comment below outlining which bike/brand you liked the most, and why. 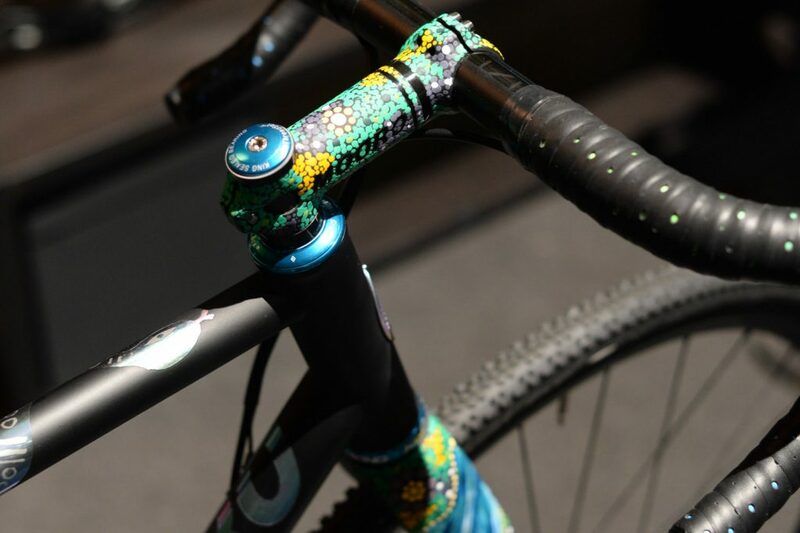 Reason being, I’d like to approach the maker of the most popular custom bike/frame – as directed by you – in order to piece together a comprehensive review of that particular bike. But before we get into this piece, let me explain my analogy. What on earth does beer and cycling have in common? Well, if you ask Ashley Bleeker (Managing Director) of a BLOC, he’ll tell you there’s plenty! They have a post-ride recovery beer that is made with alpine minerals; the perfect hydration treat after a ride. But in addition to that, let’s quickly break down beer and cycling and why I think they’re worthy of being together in this article. There’s no doubt that the beer market is ahead of the cycling market when it comes to craft/boutique operators. In fact, looking into this NAB report, craft brewers totalled 30 in 2006 and today that number has grown to 420! That is massive. Additionally, 1 in every 10 beers sold today is considered to be craft beer – so 10% of the beer market – and the experts are saying that number will double over the next 10 years. Lastly, on the beer topic – while the overall beer industry is in decline, the craft market is growing rapidly. Is this an indication of what will happen in the bicycle industry? 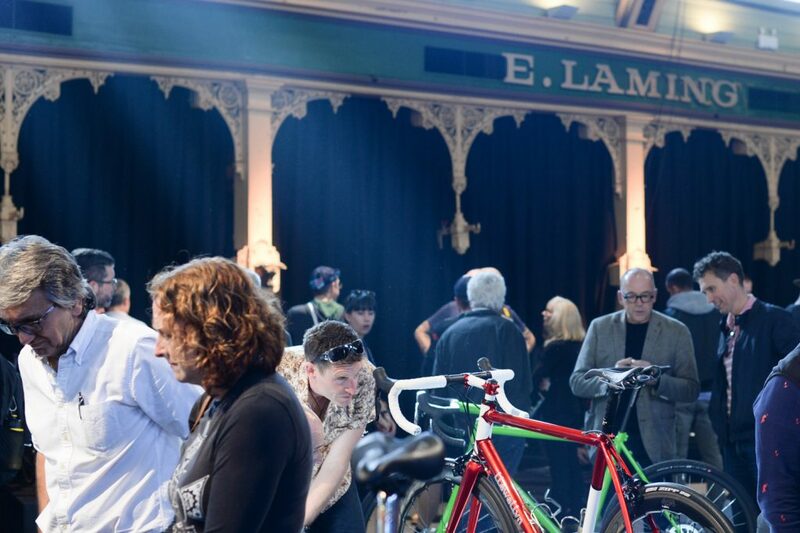 The light was shining on the bicycles and the bicycle makers at the Handmade Bicycle Show. The heavens certainly opened up for these machines! I’d love to be able to share similar stats with you on the bicycle market. However, after working full time in the cycling industry now for over 12 months I have learned that comprehensive statistics, let alone any reasonable data, is difficult to find. So, let’s have a little think about this. You know, good old fashioned common sense. If you’ve been into cycling for a while, have a think about the custom bikes you were privy to 3-5 years ago. If you’re a local, Baum will probably come to mind. Anything else? Fast-forward to the Handmade Bicycle Show in Melbourne on the 27-29 April 2018 and we had 21 producers on display. And reading many of the producer signs at the Handmade Bicycle Show, a big number state their beginning as 2015, 2016 or 2017! While I’m conscious that most brands aren’t overly prevalent yet; consider Curve, Bastion, and Prova as examples of boutique bike brands that are becoming more mainstream by the day. It was also interesting to speak to Bikes By Steve. We did a story on Steve in late 2017. At that stage Steve was acclimatising to leaving his job earlier that year and taking on bicycle frame painting full time. Well, fast forward another 6 months and Steve’s business is about to make a big step in the growth direction. He has plans to move out of his current home set up and into a facility in Abbotsford. Another signal of this custom bike phenomenon. 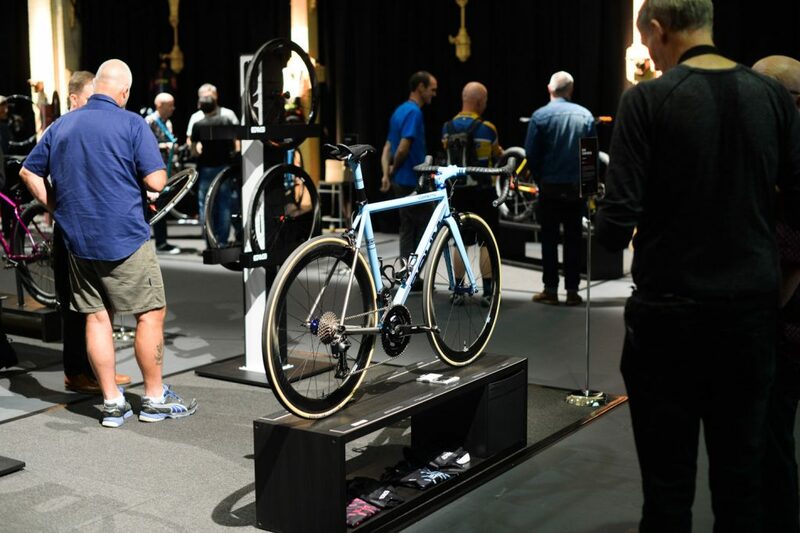 In addition to these growing boutique operators, the Custom Bicycle Show still had it’s fair share of smaller operators, who love the bicycle and make frames as a hobby outside of their 9 to 5. ‘Richard Walker’ and ‘G.Duke’ would be examples of this. In 2015 three ex-Toyota Research and Design engineers – Ben Schultz, James Woolcock and Dean McGeary – decided to make the most of huge motor industry structural changes and have a crack at bicycle manufacturing. 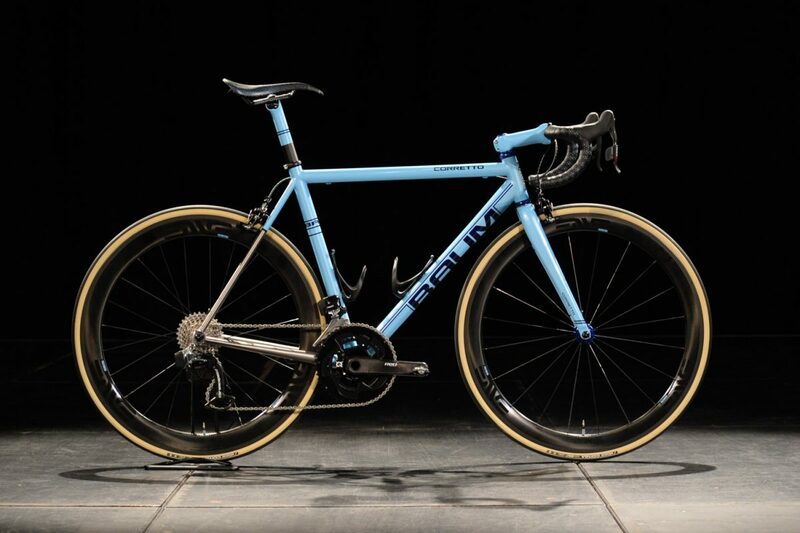 They produce custom, lightweight and performance-orientated road frames, featuring titanium 3D printed lugs and spun carbon tubes. Bastion say: Our process combines advanced custom engineering, technology, material and craft to achieve the ultimate in uncompromising performance. Definitely the most known name in the custom bicycle industry and a leader in the market. Owner Darren Baum often receives a surprised look from onlookers, given his age. People expect a crazy old frame maker (perhaps a little like the Doc from Back to the Future), but instead they’re greeted with a fresh faced Victorian who’s been building custom Baum bikes since 1996, He’s had Cadel Evans thank Baum “for the work they’ve done together” and they’ve even been featured on an Australia Post stamp! 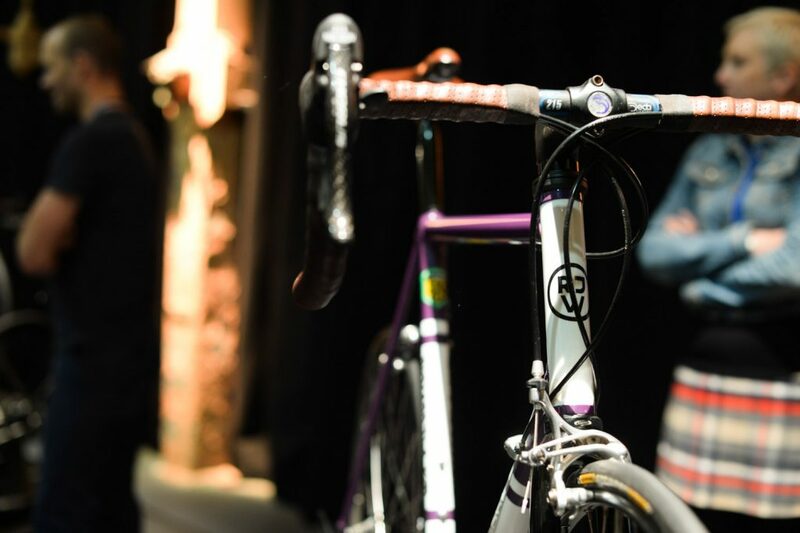 Baum say: We ride our own race and create works of art so you can ride yours. Roughly 8 years ago Curve Cycling was born out of passion from two BMX buddies, Jesse Carlsson and Steve Varga. They initially started in wheel building, but over the years have developed into a fully fledged adventure cycling phenomenon. Their bikes are produced from the need to tackle some unique or incredibly monstrous ride, and once that ride has been identified, the bike comes next. Not before! Curve say: At Curve Cycling we strive to give fellow riders new and exciting experiences via our products and adventures. From artist and designer, David Murphy, these frames are made from sustainably grown Australian timber, reinforced with flax while using superior qualities inherent with marine plywood. The wooden look and feel is certainly a unique proposition, for those who are accustomed to typical materials – which is most of us – however Damu and other wood inspired frame builders are very clear on the quality of ride and handling performance. Sean Doyle started Devlin a few years ago off the back of 30 years of cycling experience. Riding and racing in the 80’s when steel lugged frames were the norm, Sean developed an affinity for the material and now builds mostly with lugs, and in his words this “gives the opportunity to add subtle flair to a frame”. There is also a uniqueness about the way steel feels on the road that drives his bias towards this material. 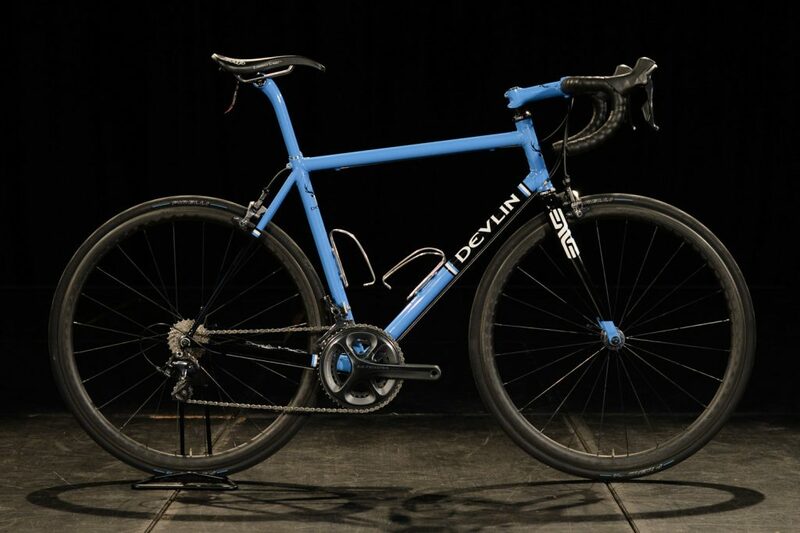 Devlin say: At Devlin Custom Cycles I build made-to-measure lugged steel frames. Bespoke and completely custom to suit your body and riding style. 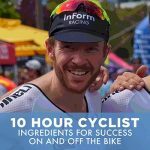 Geoff Duke has a background in both tool making and road bicycle racing, and he’s spent many years doing both. With a very close connection to the process, Geoff prefers traditional techniques such as using a hacksaw and file instead of machinery. In addition to building the frame Geoff gets involved in the sourcing side, if customers are looking for unique retro parts to go with the complete build. G.Duke say: Every frame and its intended use is as different as the people I am building for, so some discussion regarding your needs and dreams has to take place before any work begins. From racing motor bikes to studying, and then having a career in mechanical engineering – including roles at Holden’s engine plant, Ford and Toyota – when Ewen Gellie took on custom frame building in 2006 he had the ideal CV. 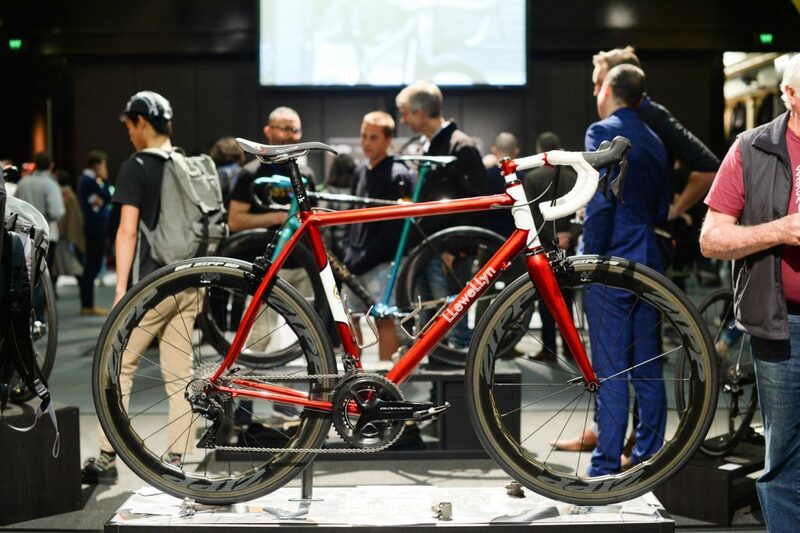 For Gellie, it’s now all about bespoke engineering, building from the best butted steel bicycle frame tubing in the world (Columbus and Reynolds). Gellie says: By ordering a bike or frame, you get the full benefit of my knowledge and expertise every step of the way. 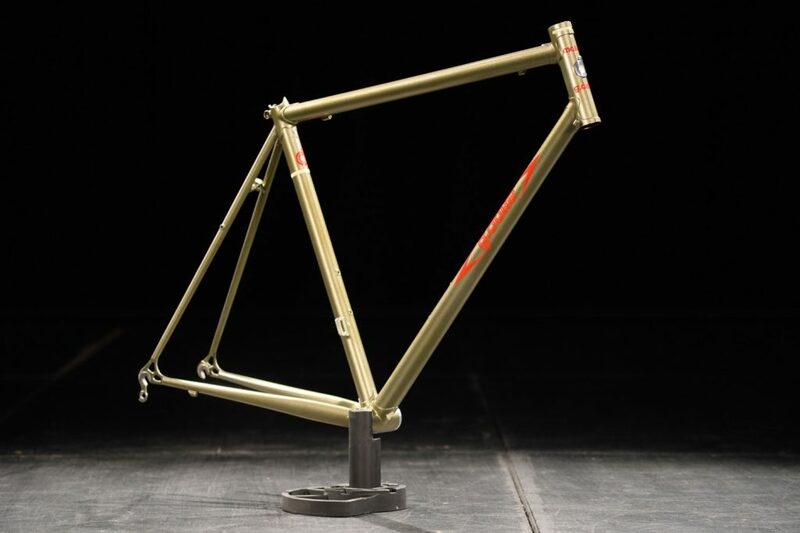 Established in Canberra in 2012, Goodspeed offers custom handmade steel bicycles. Their design and tubing slops make their frames stand out from the crowd. The frames are manufactured or full bikes assembled by four brothers and a few good mates. They are all about meticulous craftsmanship and stunning design. 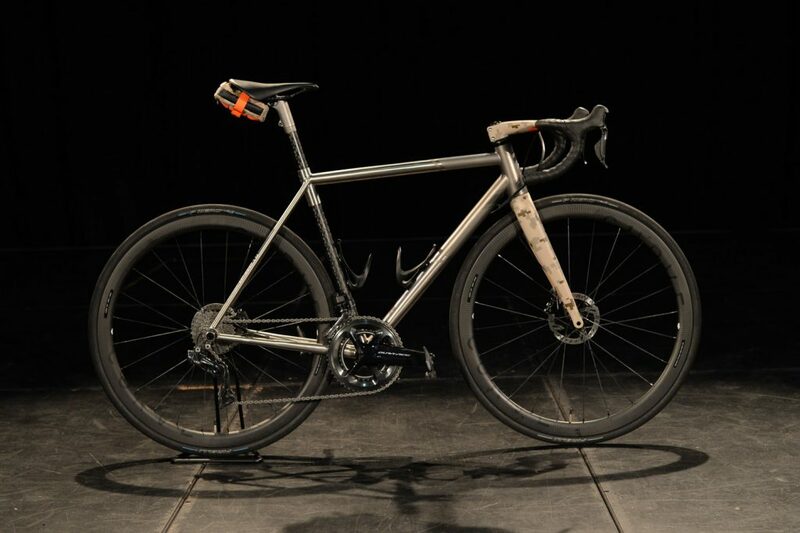 Goodspeed say: Goodspeed offers four distinct models; our original Type 1 and Type 2 models, a limited production Gravel Disc model dubbed the ‘Cyclone’ and an SL road model. For HTech it’s all about bridging the gap between performance carbon frames and modern wooden frames. They use a blend of carbon fibre and wood to create their own bespoke wooden frames. They say a wooden frame like this provides the ultimate ride – stiff, compliant and comfort, all wrapped into the one bicycle . 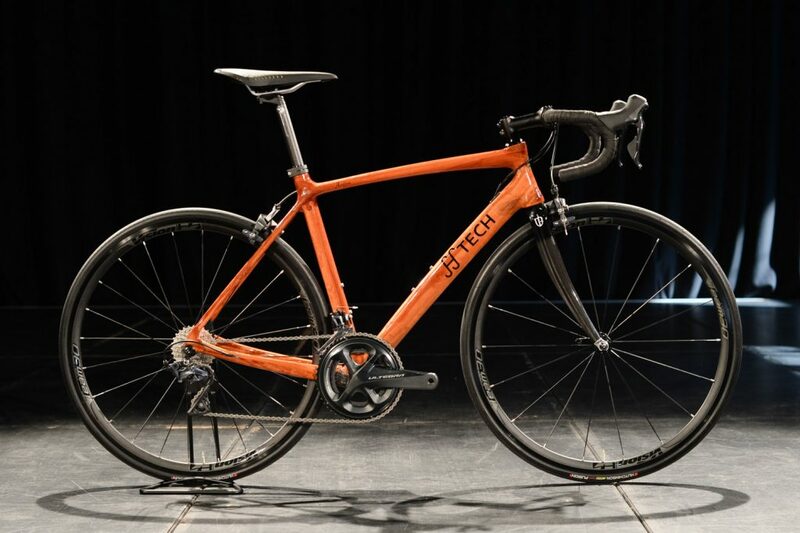 Tech say: Using HTech Bikes pioneering Selective Carbon Reinforcement (SCR) we’re able to manufacture a wood bike that uses the strengths of both materials to eliminate their weaknesses. Run by Keith Marshall out of Canberra, this one-man frame workshop is all about about custom steel bicycles where classic style meets modern function. 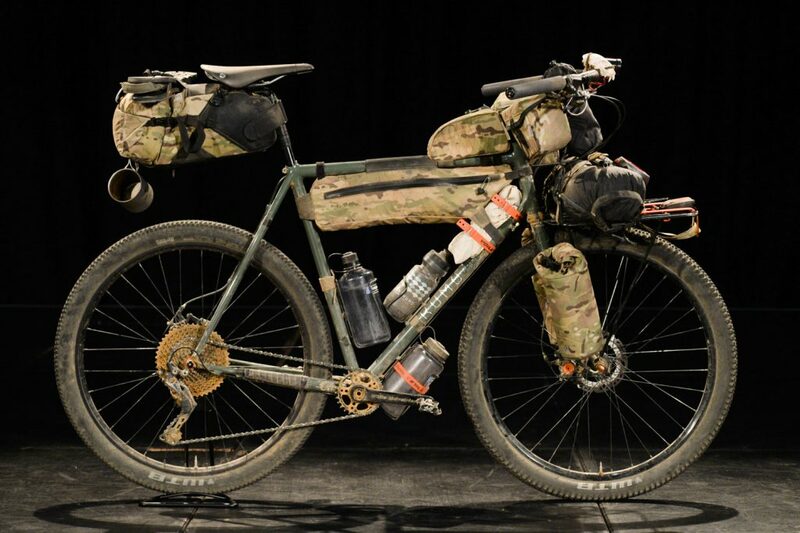 The below touring bike was perhaps the standout from the crowd at the recent Handmade Bicycle Show. A masterpiece of touring and commando styling! 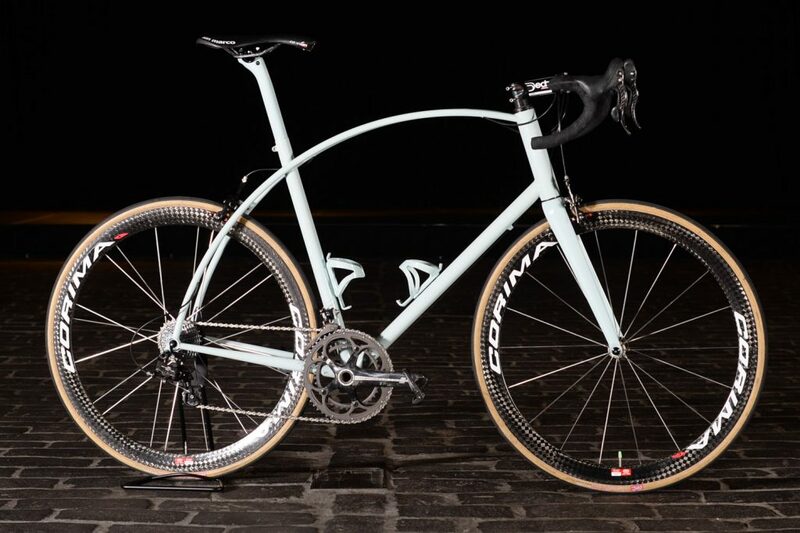 Kumo say: Driven by an incurable desire to build and create beautiful and well thought-out machines, Keith builds custom bicycles that integrate seamlessly with the rider and show the highest levels of craftsmanship and attention to detail. The creator behind these frames is Darrell Llewellyn McCulloch. The philosophy is all about blending the merits of traditional lugged construction with the very best of contemporary design. 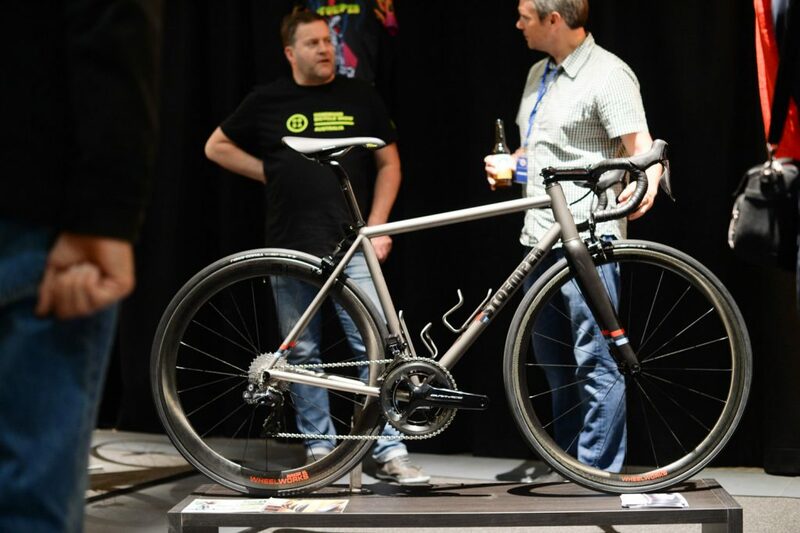 Darrell says his materials create functional, rationally designed bicycles, with the end result being excellent aesthetics and a strong build that will go the distance. Llewellyn say: Only my hands will work on your frame’s metal work. It will only be me who meticulously assembles your complete bike, and it is only me who carefully packs your new bike for shipping. Mooro – an indigenous name from the Perth region where these bicycles are made -are makers of titanium frames. They custom fit the rider and their riding style using techniques and methods that have been learned from co-creator, Chris, who’s also a chiropractor. They use their knowledge of the body, interest in geometry, and how it influences the riding characteristics to design a Mooro to suit you. Mooro say: With 10 years of experience in engineering and fabrication – including welding titanium and steel in Australia and overseas – our knowledge in this area has been invaluable in producing a high quality product for our customers. With a family history of car building, Mark Hester – Prova Cycles creator – went to university to study Mechanical Engineering. Mark’s final year thesis at uni was the design and manufacture of a carbon fibre monocoque formula chassis. This experience in composites led him to being employed by Prodrive Racing Australia. Years later and Mark took this engineering expertise into frame building. Prova say: Prova is providing an outlet for Mark to utilise the experience gained designing and testing vehicles. With a massive passion for bikes and riding, he produces custom handmade steel bike frames here in Australia. Richard has been building custom steel frames for years as a hobby. The design has retro in mind and Richard also builds wheels, either separately or as an addition to his custom built frames. Richard says: I got into frame building by not being able to find a bike that suited my geometry. Now over the past 10 years I’ve been building 1-2 custom bicycles a year for customers. You’ve got to love this: on the Stoemper home page is says “Designed to be raced the sh#t out of”. Is there anything more to say? We think not. Stoemper say: Stoemper bikes are designed and built to go really really fast. Whether you like racing or drinking beer and watching other people race, Stoemper is here to make you do both better. We aim to be nothing short of the fastest and sexiest made-in-USA brand. Prova Speciale stand out bike at the show. 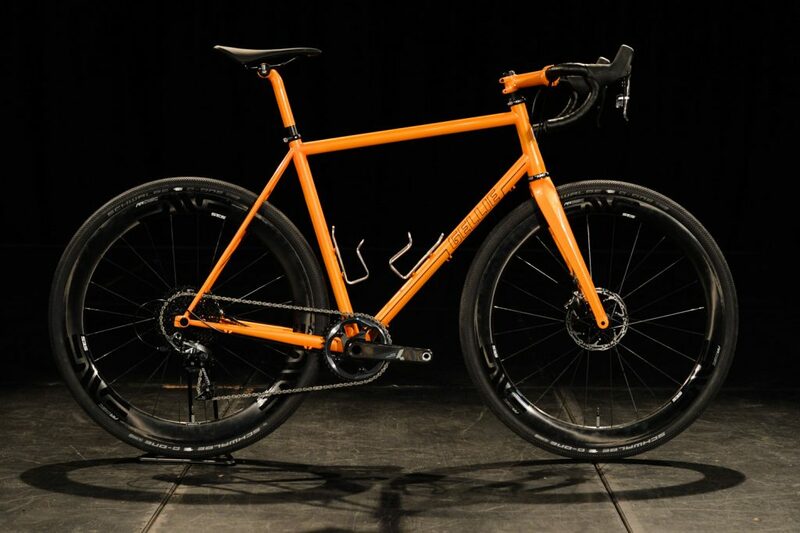 Rogers Bespoke (http://www.rogersbespoke.com) is an Adelaide based frame maker who is building some great bikes and has a very interesting story to tell – well worth a feature article. Similarly, Paconi (http://www.bikesportz.com.au/node/17) is a Melbourne based frame maker and is probably well known in Melbourne, but no so much outside of Victoria… which is one or reasons why I think a feature on Paconi may be worthwhile – I know very little about them, but judging by the number of older Paconi frames that appear for sale on Gumtree, I suspect Paconi has been operating for a long time and may have an interesting story to tell. From the little information posted on their web site, I assume they do make custom frames and also repair frames in Melbourne, as opposed to sourcing frames from overseas and assembling them. If they have been quietly building frames for long period, a feature story focusing on their approach to frame making compared to Mark Hester at PROVA or Ewen Gellie at Gellie might make for an interesting comparative story. Lastly, and at the other end of the spectrum , Adelaide based Macini (http://www.macinibikes.com) may also have interesting story to tell – Macini is perhaps better known in South Australia for its track bikes and my understanding is the brand was resurrected in recent times and is now offering full carbon frames designed in Australia (not sure where the frames are made – possibly outside Australia). 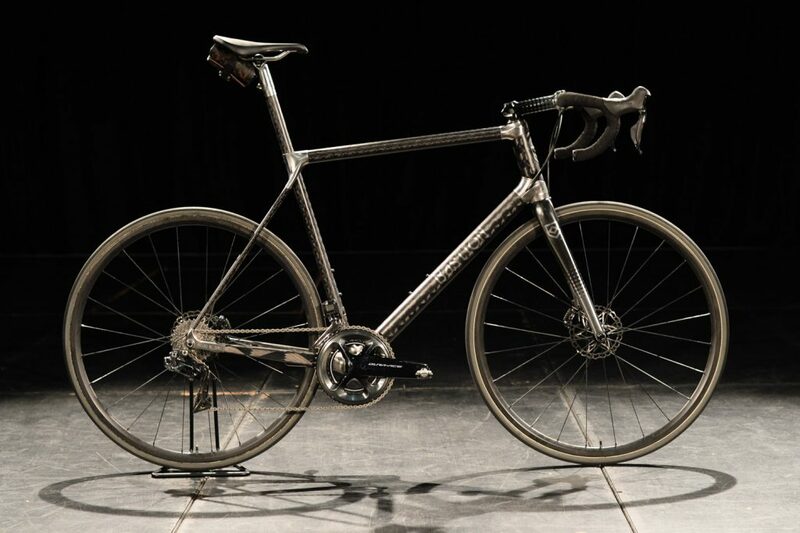 Macini’s approach would make an interesting contrast to Bastion who not only design and build beautiful bikes, but are pursuing cutting edge design and manufacturing techniques. I vote for Baum mainly cause I have one but know they will be around as they are established now. Not 100% sure on the full custom geometry as these bikes are long term investments and people do change in various manners over that period. Every time I swing my leg over, I cherish the experience no matter if it’s a short or 100k+ ride. Love the paint, finish and ride. Damn, sorry, Ewen has done more custom frames than me. Sorry Ewen! Stand out at the show for me was definitely the wooden bikes from HTech. They look like their fast just sitting on the stand, just amazing to look at. The pictures don’t do them justice. According the guy at their stand they ride as smooth and silent as steel but stiff like carbon, I would really like to see if this is true. Plus, not only do I think they looked the best, they look way more functional than the Damu plybikes and less then half the price. Great show too, little pricey but once you got in, drool worthy bikes everywhere you look and no tiny booths, very well presented show. Just my opinion but HTech for best bikes in show. Went in looking for a new titanium frame, came out wondering whether or knot I wood by a timber frame. Great article but struggling to understand why curve is included as I was under the assumption that they are made in Asia?